I know I’m behind and I owe some sneak peeks. You might be thinking, What happened to the blog?!?!?! And what’s with all the white space at the top?!?!?! 2009 brings a lot of changes…..starting with a new blog (which is in the works right now). Look for more changes VERY soon! Baby Porter v. 2.0, originally uploaded by LilSweetPeaPhoto. Those of you on facebook already know, and some of my very patient and understanding fall clients also know. But now it’s time to announce it to all my blog readers. We are 17 weeks and a day into Baby Porter v. 2.0. I apologize for the ultrasound from 9 weeks. Honestly I’m too lazy to find the 13 weeks one and scan it, LOL! 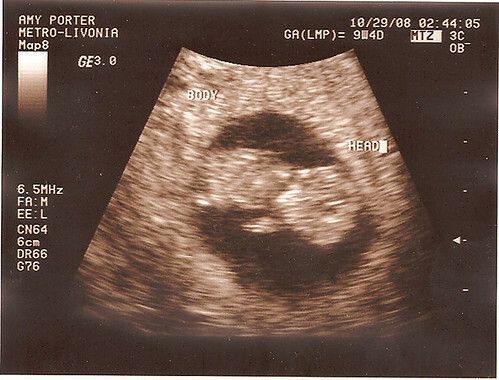 To answer all the questions floating around….#1 We are due May 29th (which is a VERY popular day; my dad’s b-day, my maid of honor’s, her mom, several client’s children, etc). #2 We will be finding out what it is. Our appointment is scheduled for Jan 2nd. We’re hoping girl again 😉 #3 what does this mean for my clients? With Madeline I went on bedrest at 36 weeks. I’m going to play cautious and follow the same timeline for this baby. The last sessions I will be scheduling will be in March. This should allow time for editing, ordering and delivery before I deliver. I’m going to tentatively say that I won’t be taking new sessions till mid-July. I’ll be having another c-section and I’m not sure how fast recovery is the second time around, LOL! I know I have some baby planners that will have milestones happening between March-July. If this is you, please contact me and we can work out the details. Meet and Greet, originally uploaded by LilSweetPeaPhoto. Well I have to share my proof I actually met the New Kids. I’m next to Jordan and his hand is on my shoulder, LOL! My sister is in the maroon next to Danny and behind Joe. Yes, I’m a Joe girl, but he was chatting and ran into the photo last minute. Trust me, this summer I WILL be next to him in the photos, LOL! Funny thing is my sister turned into a Jordan girl at the show…so I can tease her that he touched me, LOL! One thing you’ll notice…they are so small! I’m 5’7″ and was wearing wedges. I was about the same height as Joe and Donnie and almost the same as Jordan. Jon was the tallest by far and even he wasn’t that tall, LOL! 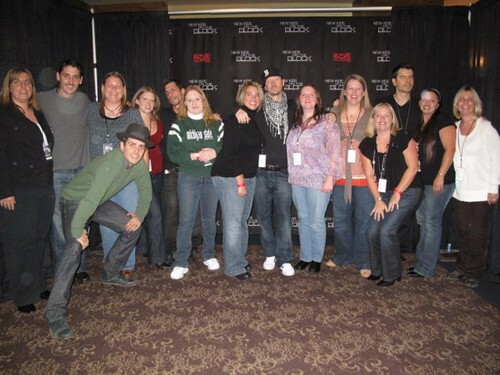 Okay so there’s the proof….I’m the nut job that spent $375 to meet NKOTB and sit front row. And yes, I’ll do it again. Secretly I’d love to follow them, LOL!